Market Opportunities Unlimited (MOU) Blog: We Need Your Opinion! Identity theft - the acquisition and use of a person's private identifying information, in order to commit identity fraud (illegal activities in the stolen person's name), affected 8.1 million Americans in 2010. ...This, according to Washington Post article, "The Color of Money: Identity-theft statistics look better, but you still don't want to be one", by Michelle Singletary. This figure is 28% less than 2009's figure of 10.4 million Americans. Although losses from identify fraud decreased to US $37 billion from US $56 billion in 2009, it is still a matter of grave concern, as according to the above article, an American, on average, pays out US $631, as a result of being defrauded. The statistics above, refer to Americans, but identity theft and frauds affects everyone. Identity theft and fraud not only put your assets and property at risk, they damage your good reputation and that of your business. Your first line of defense against identity theft/fraud is to ensure that you keep personal information private and become very selective about disclosing personally identifying information online and offline. ...are all great first steps to take in protecting your identity online and offline. However, you can go a bit further. Since you, personally, can't keep track of the thousands of websites that may contain your personal information, or of hackers who may have accessed some of these websites, due to their poor security policies, there is software that will do all this for you! 1) Giving you an Identity Health Score - an up-to-the-minute assessment of your current identity theft risk, indicating how vulnerable you are to identity theft. 2) Conducting Information Monitoring. IdentityHawk analyzes billions of public and "black market chat room" records to detect potential threats to your identity. 3) Giving you Immediate Alerts - text/email messages that are sent to you, the minute suspicious event takes place, so that you can take corrective action. ....Thus helping you to safeguard your assets, properties, and your/your business's good name. So prevent yourself from becoming the next victim of identity theft /fraud. Follow the above tips and use IdentityHawk, to ensure your complete identity theft protection online and offline. We value your feedback. Please let us know how this post has facilitated your self-protection from identity theft/fraud by clicking on the Comment link beneath this post and leaving your comment. Would You Work in a "Coconut" Office? Well, these ergonomic offices of the future may make a lot of sense, if you telecommute or want to have your own home-office away from the everyday household din (noises). These coconut-shaped offices are actually called pods. They are manufactured by the UK-based company, Archipod (pronounced ‘ark-ee-pod’, as in ‘architecture). 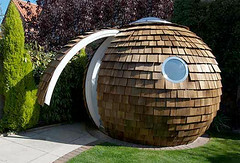 Pods are a great way to conserve on energy and make use of recycled materials, right in your own back or front yard. The office's exterior is made up of reused timber (cedar shingles) from Forest Stewardship Council (FSC)- registered suppliers or from surplus manufacturing. established to promote the responsible management of the world's forests. The FSC is also a certification system that provides internationally recognized standard-setting, trademark assurance and accreditation services to companies, organizations, and communities interested in responsible forestry). The interior walls are made of recycled fiberglass. They are encased in a high-performance foil insulation that is covered by plasterboard, which also has a vapor barrier. "The porthole windows are made from double-glazed stainless steel, whilst the dome roof is of double-skinned carbonate that harnesses natural light and ventilation. The Pod is prefabricated in sections – so that if your garden is hard to access, the Pod can be carried through your house. It measures approximately three meters (about ten feet) in diameter and has a height of two and a half meters (about eight feet). It comes with an ergonomic semicircular desk that has cable management below it. Custom-made drawer units and hardwood desktops are available by request. The timber floor contains fiberglass insulation and the foundations are made up of concrete or steel posts. The Pod is made-to-order and starts at around £12,000 (about US $20,000). This includes the insulated Pod, cedar shingles, door, window, glazed roof, foundations and full installation." According to the above Gizmag article, the Pod can be used in a variety of other ways – like a playroom, teenager retreat, or even an extra entertainment area. Please see Archipod's website for more details. Would you buy a pod if you worked from home or telecommuted? Do you think this could work in Jamaica?.. or would the walls and entire structure have to be made of different materials, to withstand hurricanes and earthquakes? (I would like to thank Stanley Lieber for the use of his Flickr inset photo of the pod. Other photos can be obtained from Archipod's website). 1) The Forest Stewardship Council's website, accessed, February 3,2010.